Jesuit universities from every part of the world officially began their Assembly this morning at the University of Deusto (Bilbao) in a ceremony presided by the King of Spain, Felipe VI; the president of the Basque Government, Iñigo Urkullu; and the Father General of the Society of Jesus, Arturo Sosa SJ. Under the theme “Transforming Our World Together”, up to 300 attendees, including rectors and academic authorities from leading Jesuit universities and colleges from across the globe, will explore the most urgent priorities for their institutions in today’s world and set up a network to face those challenges. Addressing all the participants gathered in Deusto’s classical main hall, Father General Arturo Sosa SJ’s first words (his main speech will be on Wednesday) emphasized that “we have the opportunity to take a gigantic step in the service that the Society of Jesus and its universities give to the Church and the world, if we grow in collaboration among ourselves and if we are able to unite in a common horizon the immense work that universities around the world are already doing”. In Arturo Sosa SJ’s opinion, Jesuit universities should “delve deeper into our common commitment without losing any of our roots in each of the places”. The goal is “to help the Church in its discernment of the service of reconciliation, between human beings, with Creation and with God”. Before the Father General’s words, Deusto rector, Jose María Guibert SJ, recalled a letter that St Ignatius sent to the Spanish king at that time: “All the goodness of Christianity and of the whole world depends on the proper education of youth”, words that a father general could also send to a king of Spain today. Guibert took this opportunity to mention some of the most revered Jesuits from our area: Ignatius himself, Francis Xavier, Francisco Gárate, Esteban de Zudaire, Juan de Mayorga, and, of course, Pedro Arrupe and Ignacio Ellacuría, both of whom were from Bilbao and such an inspiration to Jesuits in modern times. Set against the background of this long tradition, our efforts this week focus on promotion of healing and reconciliation in our local and regional communities by means of our universities. King Felipe VI of Spain shared memories of his student years at Georgetown. With the Jesuits he learnt that “academic excellence must always go hand in hand with values like effort, responsibility and the common good”. 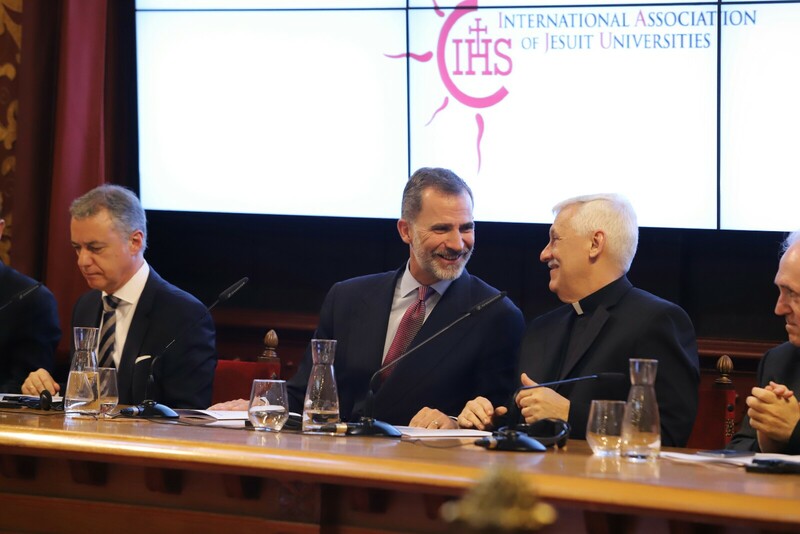 Felipe VI stressed that Jesuit universities have a specific model in which “values are at the core”. He also mentioned the Jesuit intellectual apostolate, saying that it is all the more important today, in a world that faces challenges like inequality, violence, human rights violations or environmental damage. The lehendakari, Iñigo Urkullu, took advantage of his speech to show his interest in the different areas that the Assembly will work on, and to state that the Basque people share the same worries and challenges for the future. The inaugural address of the Assembly, entitled “Catholic Social Teaching and the Role of the Jesuit University Today” was given by Cardinal Gianfranco Ravasi, President of the Pontifical Council for Culture and President of the Pontifical Commission for Sacred Archeology. The CELEBRATION in DEUSTO UNIVERSITY-BILBAO of the ASSEMBLY of the INTERNATIONAL ASSOCIATION of JESUIT UNIVERSITIES (IAJU) under the SLOGAN: “TRANSFORMING OUR WORLD TOGETHER” is an excellent OPPORTUNITY to COMMUNICATE the existence of EKHUM WALL..! a PROJECT with a strong and committed SOCIAL VOCATION that CONTINUES to develop for MORE than 20 YEARS..! Know it and DECIDES ..!